Molly and I spent all day driving around and shopping and eating at Chipotle and laughing and carrying on. One of the stops we made was Fixtures-Plus (Brentwood, locals, also one in Balto) a warehouse of old store fixtures and displays, including a room full of mannequins. I’ll take my camera next time; it was INSANE in the membrane! Of course the mann-girl I wanted was on a shelf three stories up, so this guy had to go lug a ginormous ladder over to git ‘er down. 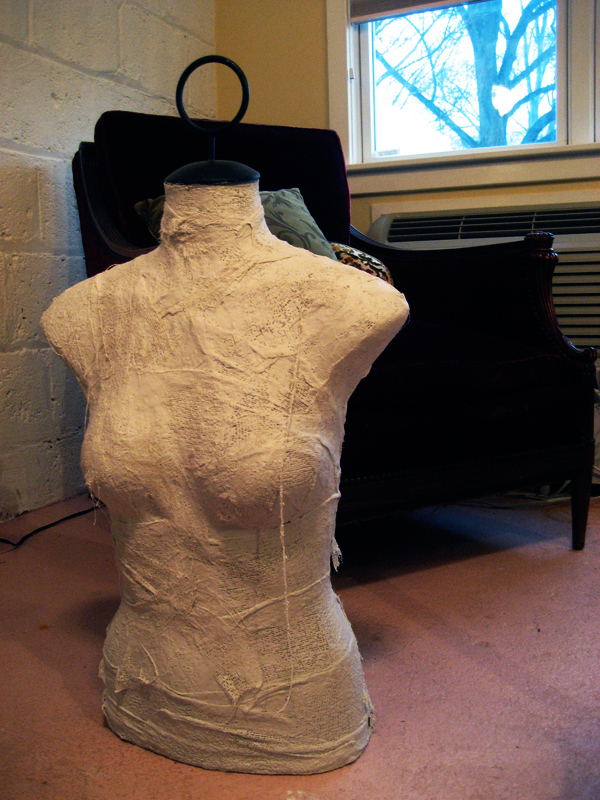 Next stop was to score some plaster of Paris gauze strips and when we got home we covered up her ugly plastic self, zombie-style. I can’t believe how cool she turned out. And it was so messy and fun! Total cost: $40. Which beats the hell out of the mannequin Filene’s was “liquidating” for $75. Anyway, look for my new undead model when So Charmed relaunches. 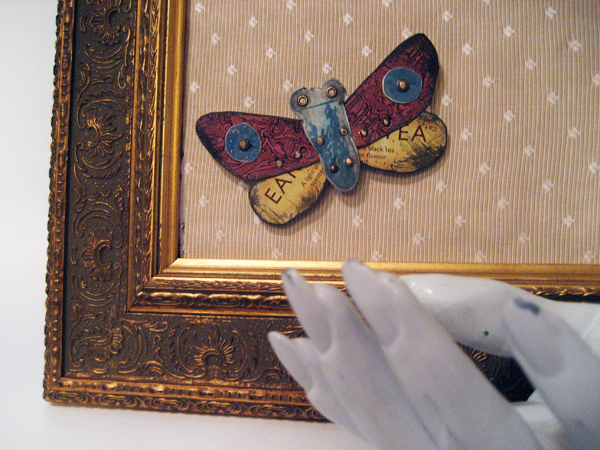 Here is Earl Moth, he was once a tea tin, of the Earl Gray variety. I’m testing out photographing with just a few additional props so that I can give you a sense of how the pieces look worn (and without nagging Molly constantly to model for me). So it’s cool to see the moths upright instead of lying on the white seamless for one of the shots. Right? Oh, and that’s a hand we picked up at Fixtures. It had white dust pouring out of it, which made me instantly think of cocaine smuggling. I have been watching a LOT of Breaking Bad via Netflix. A LOT!!! Hand was $5. There was a spooky pile of them. Some with arms! Legs and feet too. I’m telling you, the place was too much. 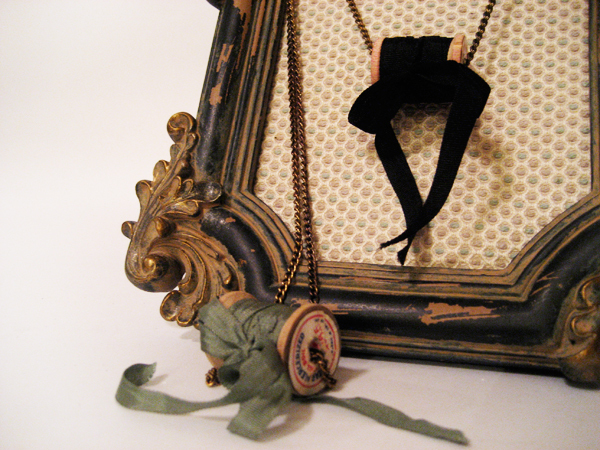 Here are some sweet little spool necklaces that have been around here forever (never listed. Why? I don’t know! )… these are the ones that have poetry and other writings handscrawled around the vintage wooden spool, underneath the ribbon. You can see them undressed on flickr. The frame was scored at my new other favorite place on planet Earth, HOBBY LOBBY. Is that not the queerest name ever?!? It’s just lame! But people, this place kicks. We had so much fun and it took hours to make our way through the airplane hangar sized place. Only drawback… a biiiiiiiig shlep out to the exurbs (Laurel, locals). A field trip, for sure. Anyway, the light was gone for the day, so these photos aren’t the best, but since they are just ideas at this point, let me know what you think! I’ll still do lots of white on white, b/c I think those are so pretty and really show the work.